The faint, ephemeral glow emanating from the planetary nebula ESO 577-24 persists for only a short time — around 10,000 years, a blink of an eye in astronomical terms. 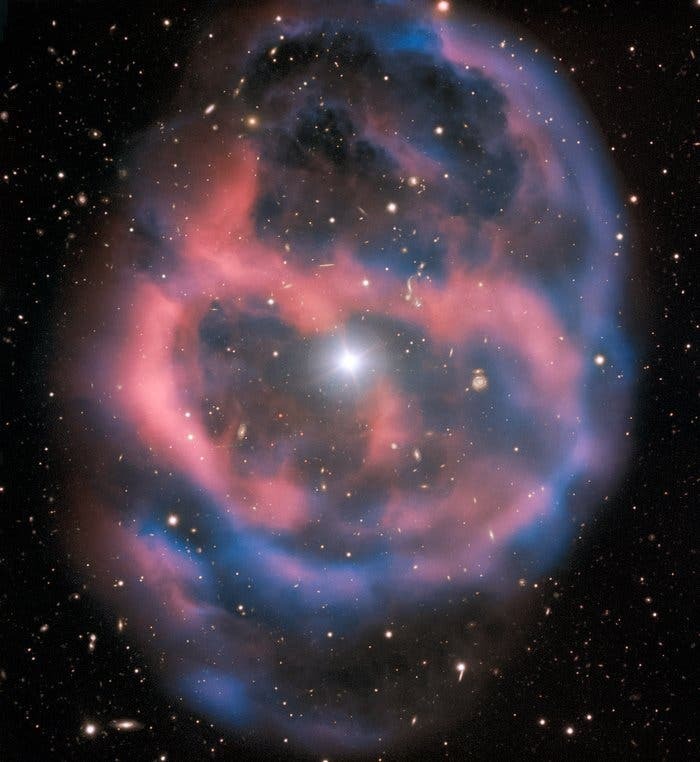 ESO’s Very Large Telescope captured this shell of glowing ionized gas — the last breath of the dying star whose simmering remains are visible at the heart of this image. As the gaseous shell of this planetary nebula expands and grows dimmer, it will slowly disappear from sight. Shrugging off its outer layers, the nebula’s central star is contracting and becoming hotter, evolving towards a final white dwarf phase. Abell 36, the central star, is estimated to have a surface temperature of over 73,000 K, compared to the Sun’s present 6,000 K temperature. As a result, the intensely hot star is much brighter in ultraviolet light. This stunning planetary nebula was imaged by one of the VLT’s most versatile instruments, FORS2. The instrument captured Abell 36, as well as the surrounding planetary nebula. The red and blue portions of this image correspond to optical emission at red and blue wavelengths, respectively.